The barrens-forming sea urchin Centrostephanus rodgersii (Diadematidae) has recently undergone poleward range-extension to Tasmania where grazing of diverse and economically important macroalgal beds has occurred. We compared growth, biometric, dietary and morphometric characteristics of C. rodgersii between macroalgal habitat and adjacent barrens to inform population dynamics of the sea urchin within the newly extended range. The age structure of C. rodgersii in macroalgal habitat and adjacent barrens is similar, suggesting that both habitats have been influenced by similar recruitment events. However, there are clear differences in body size, body mass, spine length and diet of sea urchins in the 2 habitat types. We identified 2 broad morphologies of C. rodgersii. The first is of relatively large size with thick test, rapid growth and short spines, that grazes macroalgal beds (macroalgal eco-morph). The second ecomorph persists on the barrens habitat and demonstrates smaller body size, slower growth and thinner test, with gut contents dominated by closely cropped filamentous and/or coralline algae; but occurs at higher density, possesses longer spines and appears to enhance the persistence stability of barrens habitat once it is formed (barrens ecomorph). Invading dense, swell-prone macroalgal habitat of eastern Tasmania, the phenotypic plasticity displayed by this sea urchin appears to be an important mechanism facilitating colonisation of reef habitats within the extension region. 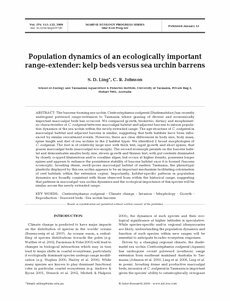 Importantly, habitat-specific patterns in population dynamics are broadly consistent with those observed from within the historical range, suggesting that patterns in macroalgal-sea urchin dynamics and the ecological importance of this species will be similar across the newly extended range.